Obama’s Pentagon and C.I.A. Picks Show Shift in How U.S. Fights :: Ed'son de Pary E.A. 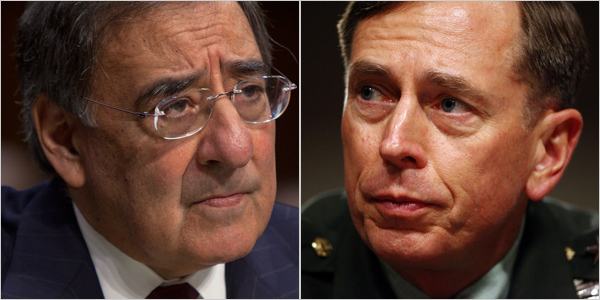 Leon E. Panetta, left, and Gen. David H. Petraeus. WASHINGTON — President Obama’s decision to send an intelligence chief to the Pentagon and a four-star general to the Central Intelligence Agency is the latest evidence of a significant shift over the past decade in how the United States fights its battles — the blurring of lines between soldiers and spies in secret American missions abroad. Secretary of Defense Robert M. Gates is preparing to step down soon, setting in motion changes at the top in the Pentagon and the Central Intelligence Agency. On Thursday, Mr. Obama is expected to announce that Leon E. Panetta, the C.I.A. director, will become secretary of defense, replacing Robert M. Gates, and that Gen. David H. Petraeus will return from Afghanistan to take Mr. Panetta’s job at the C.I.A., a move that is likely to continue this trend. As C.I.A. director, Mr. Panetta hastened the transformation of the spy agency into a paramilitary organization, overseeing a sharp escalation of the C.I.A.’s bombing campaign in Pakistan using armed drone aircraft, and an increase in the number of secret bases and covert operatives in remote parts of Afghanistan. General Petraeus, meanwhile, has aggressively pushed the military deeper into the C.I.A.’s turf, using Special Operations troops and private security contractors to conduct secret intelligence missions. As commander of the United States Central Command in September 2009, he also signed a classified order authorizing American Special Operations troops to collect intelligence in Saudi Arabia, Jordan, Iran and other places outside of traditional war zones. The result is that American military and intelligence operatives are at times virtually indistinguishable from each other as they carry out classified operations in the Middle East and Central Asia. Some members of Congress have complained that this new way of war allows for scant debate about the scope and scale of military operations. In fact, the American spy and military agencies operate in such secrecy now that it is often hard to come by specific information about the American role in major missions in Iraq, Afghanistan, Pakistan and now Libya and Yemen. The operations have also created tension with important allies like Pakistan, while raising fresh questions about whether spies and soldiers deserve the same legal protections. The phenomenon of the C.I.A. becoming more like the Pentagon, and vice versa, has critics inside both organizations. Some inside the C.I.A.’s clandestine service believe that its bombing campaign in Pakistan, which has become a cornerstone of the Obama administration’s counterterrorism strategy, has distorted the agency’s historic mission as a civilian espionage agency and turned it into an arm of the Defense Department. Henry A. Crumpton, a career C.I.A. officer and formerly the State Department’s top counterterrorism official, praised General Petraeus as “one of the most sophisticated consumers of intelligence.” But Mr. Crumpton warned more broadly of the “militarization of intelligence” as current or former uniformed officers assume senior jobs in the sprawling American intelligence apparatus. For example, James R. Clapper Jr., a retired Air Force general, is director of national intelligence, Mr. Obama’s top intelligence adviser. Maj. Gen. Michael Flynn, formerly the senior intelligence officer in Afghanistan, is soon expected to become one of Mr. Clapper’s top deputies. “If the intelligence community is populated by military officers, they understandably are going to reflect their experiences,” Mr. Crumpton said. At the Pentagon, the new roles raise legal concerns. The more that soldiers are used for espionage operations overseas, the more they are at risk of being thrown in jail and deniedGeneva Convention protections if they are captured by hostile governments. And yet few believe that the trend is likely to be reversed. A succession of wars has strained the ranks of both the Pentagon and the C.I.A., and the United States has come to believe that many of its current enemies are best fought with timely intelligence rather than overwhelming military firepower. These factors have pushed military and intelligence operatives more closely together in the years since the Sept. 11, 2001, attacks. American officials said that, for the most part, the tensions and resentments were greatly reduced from the days when Defense Secretary Donald H. Rumsfeld expanded Pentagon intelligence-gathering operations to become less dependent on the C.I.A. The secret “Execute Order” signed by General Petraeus in September 2009 authorized American Special Operations troops to carry out reconnaissance missions and build up intelligence networks throughout the Middle East and Central Asia in order to “penetrate, disrupt, defeat and destroy” militant groups and “prepare the environment” for future American military attacks. But that order greatly expanding the role of the military in spying was drafted in consultation with the C.I.A., administration officials said. General Petraeus has worked closely with the C.I.A. since the Bosnia mission in the 1990s, a relationship that grew during his command tours in Iraq and Afghanistan. In fact, some of the missions he has overseen seem to have been more like clandestine operations than traditional military missions. Even before General Petraeus took over as the leader of the military’s Central Command overseeing Middle East operations nearly three years ago, he ordered a study of the threat posed by militants in a country few American policy makers had focused on — Yemen. Al Qaeda’s branch in Yemen is now considered the most immediate threat to the United States. The general’s relationship with Yemen’s mercurial president, Ali Abdullah Saleh, was well documented in the diplomatic cables released by WikiLeaks last year. And the military’s operations there, beginning with airstrikes in December 2009, are shrouded in even more secrecy than the C.I.A.’s drone attacks in Pakistan. Mr. Saleh, however, drew the line at General Petraeus’s request to send American advisers to accompany Yemeni troops on counterterrorism operations. Now, with Mr. Saleh’s government teetering on the verge of collapse, General Petraeus is taking over at the C.I.A. — and will once again be part of America’s secret war in Yemen. Obama | Petreus | Panetta | CIA | Pentagon.